In 2017 the state of California experienced a fire season that seemed to surpass any other in recent memory. This disastrous fire season was then exceeded in terms of lives lost, and destruction to property by the 2018 fire season. In October 2017, the Tubbs Fire took its place as the most destructive wildfire in California’s history by destroying 5,636 structures, and killing a total of 22 people. In the wake of this tragic event that befell the Northern Bay area communities, the people of California were wishfully thinking that the reappearance of these extreme fires would subside for an extended period of time. These optimistic thoughts were quickly given a reality check when the Camp Fire destroyed the community of Paradise, CA in the matter of hours. Fire officials continue to diligently complete the search for missing citizens, and damage inspections of the surrounding areas, the numbers below are current up to when this was published. As of right now the total number of destroyed structures is 18,804, which over triple the previous most destructive fires record. The death count for this incident is staggering as well with the current number being 85 human lives lost during this incident. The Thomas Fire in December was the second record setting fire of 2017, taking the position of most acres burned. This record was overtaken this year by the Ranch Fire, which burned 410,203 acres near Clearlake, CA. With these disturbing fires seemingly getting worse every year, what do the upcoming changes look like for the average homeowner in California? For home insurance carriers, the State of California is being assessed as a risk versus gain analysis, on a geographic, case-by-case basis in relation wildfires. These companies are becoming more and more hesitant to expand into the more rural reaches of California. In some areas, certain home insurance carriers have resigned to no longer writing new business due to the extreme wildfire risk that has been becoming ever so prevalent in recent years. These same companies will be quietly removing their presence from these aforementioned areas by no longer renewing policies when the term of their legal obligation is up, at which point a non-renewal notice is issued. In efforts to account for the increase in economic losses that the insurance carries have, and will be seeing due to wildfire, there is no doubt that premium rates will be going up. These increases will be seen across the entirety of the state, but as you move into the more fire prone areas, otherwise known as the wildland urban interface, the rate at which the increase will occur will be more dramatic. To protect the residents of California, the state legislature has passed a bill clarifying that catastrophic losses to insurance companies cannot be passed onto ratepayers in one large lump sum. What will eventually happen is, there will be a steady increase in yearly premiums over a number of years to assist with the companies trying to recoup from these devastating events. There is a similar process when a utility company is found to be the root cause of a wildfire. When utility company’s equipment has been found to be the cause of a fire, these entities can be liable for shouldering the costs of fire suppression, damages to structures, and damages to other economic and natural resources as well. The amount of money that these factors add up too, can be quite staggering. This diagram shown in the paper “Wildfire Costs in California: The Roll of Electric Utilities” written by Wharton University of Pennsylvania, gives a visualization of the legal process post wildfire. In the case of investor owned utility companies, such as Pacific Gas and Electric, how these costs are paid for is determined by the CUPC (California Public Utilities Commission). Since rates are fixed for publicly owned utility companies, the recoupment of the costs in relation to a fire have to be evaluated by the CUPC before the burden can be placed onto ratepayers. The CUPC evaluates the Utilities request to have the ratepayers absorb this cost by determining if the company has abided by acting “reasonably and prudently” in relation to the failure of their equipment. If the utility company is found to be negligent in anyway, this request to pass the financial burden onto the ratepayers would be declined. RedZone Software seeks a competent and motivated individual to join our team as a Platform Software Engineer. This is an opportunity to develop, build, and manage systems for monitoring and deploying software that enables real-time global disaster monitoring. This role requires a technically competent, well-organized person who can work closely with our development team. This job makes a difference. For the past decade, our work at RedZone has continuously contributed to public safety awareness and improved emergency response, and has ultimately saved lives and property. In return for your intelligence, initiative and dedication, we offer a supportive environment, a flexible schedule, a wide range of technical opportunities, and chance to be a central contributor to a unique business. This is a full-time salaried position with benefits that include health, PTO, paid vacation and 401K. Compensation is negotiable and will be based on education and experience. RedZone is an Equal Employment Opportunity/Affirmative Action Employer. RedZone does not accept solicitations from recruiters or employment agencies. Please email your resume, cover letter and portfolio (if available) to resumes@redzone.co with the subject line “Platform Software Engineer”. Calls and faxes will not be accepted. We will contact you via email or phone to schedule an interview. What is a Fire-Use Wildfire and How is it Beneficial to Forests? Not every naturally occurring wildland fire is actively suppressed. Naturally occurring wildland fires are normally caused by lightening strikes in areas with fallen trees and other dry accumulated fuels. Under certain circumstances, some wildland fires will be allowed to actively burn in order to help clear these fuels and promote forest health. When a wildland fire is allowed to burn within a pre-defined area to achieve a resource or protection objective it is referred to as a Fire-Use Wildfire. A fire-use fire is different from a prescribed fire in which firefighters intentionally set fires to achieve similar objectives. In addition, federally mandated guidelines state that every human-caused wildland fire will be suppressed and will not be managed for resource benefits. Additionally, once a wildland fire has been managed for suppression objectives, it may never be managed for resource benefit objectives. In other words, a wildland fire must either be suppressed or used for a resource/protection objective but not both. The Departments of Interior and Agriculture, together with tribal governments, state governments, and local jurisdictions, have the responsibility for protection and management of natural resources on public and Indian Trust lands in the United States. A wildland use fire is one option available to Federal agencies that have an approved land use plan and need to achieve a resource or protection objective. Contributing factors that help steer a fire managers decision-making process are often incident specific. Location, available resources, predicted weather, topography, air quality, and predicted fire behavior are all factors that contribute to fire management decisions. If a fire is located in remote, steep, rugged or highly inaccessible terrain and people are not threatened, managing the fire as a wildland use fire to meet a protection objective may be more appropriate and can help avoid putting firefighters in unnecessary danger. A wildland use fire can meet resource objectives like helping to maintain healthy forests by supporting a diverse ecosystem. Some wild plants and trees even need fire in order for their seeds to germinate. A carefully monitored wildland use fire can also help reduce naturally occurring fuels accumulation, which could lead to an even bigger wildfire if left unchecked. The Empire Fire burning near Yosemite National Park was caused by lightening and is being managed to promote the health of the ecosystem and protective objectives. https://www.redzone.co/wp-content/uploads/2017/08/new-growth.jpg 1067 1600 Michael Cox /wp-content/uploads/2016/02/rzlogo-300x138.png Michael Cox2017-08-24 14:28:452017-08-24 14:28:45What is a Fire-Use Wildfire and How is it Beneficial to Forests? According to the National Interagency Fire Center, June 2017 saw record-setting heat events throughout the western United States, while the southeastern wildfire season diminished due to precipitation. The southwestern wildfire season (through Arizona and New Mexico) is expected to end with rains at the end of July, which is typical. However, Southern California will continue to experience wildfire events due to heat and critically dry fuel. The following regional wildfire forecasts for late July and August 2017 are based on predictions and research from the National Interagency Fire Center. Alaska: Throughout August, fuel dryness and wildfire potential is high in the Upper Yukon Valley and other parts of northern Alaska. Likelihood of wildfires is lower for the second half of the summer than the first half throughout the state. Late-August rains are expected to end fire season. Northwest: The remainder of July will see typical rainfall and temperatures. Conditions warmer and drier than average will likely occur in August, but significant large wildfire potential will remain normal. Fire potential will start to decline at the end of August. Northern California + Hawaii: Above average wildfire potential is expected in the San Francisco Bay area, the mountains surrounding the San Joaquin Valley and the western side of Hawaii’s Big Island. Wildfire potential is below normal in the Northern Sierras due to above average precipitation in the spring, and wildfire potential is normal for the east side of the region through August. Southern California: In July and August, fire potential is higher than expected in the higher elevations of the Sierras and above normal fire potential is expected in the foothills and inner valley areas. Everywhere else has average expected wildfire potential. The high wildfire potentials are due to extended heat waves in June, which may cause critical dryness to be reached by the end of July. Northern Rockies: Central-eastern Montana and western North Dakota experienced little rain in June, resulting in drought conditions and above average wildfire potential through August. Normal potential is expected in the rest of the region. The entire region will likely experience above average temperatures into September. Great Basin: Before July, the region experienced weather extremes, with temperature being ± 20 degrees compared to the historical average. The high elevations of Wyoming and Idaho will see below normal wildfire potentials through August, while the lower elevations of Utah and Nevada will see above normal fire potential. 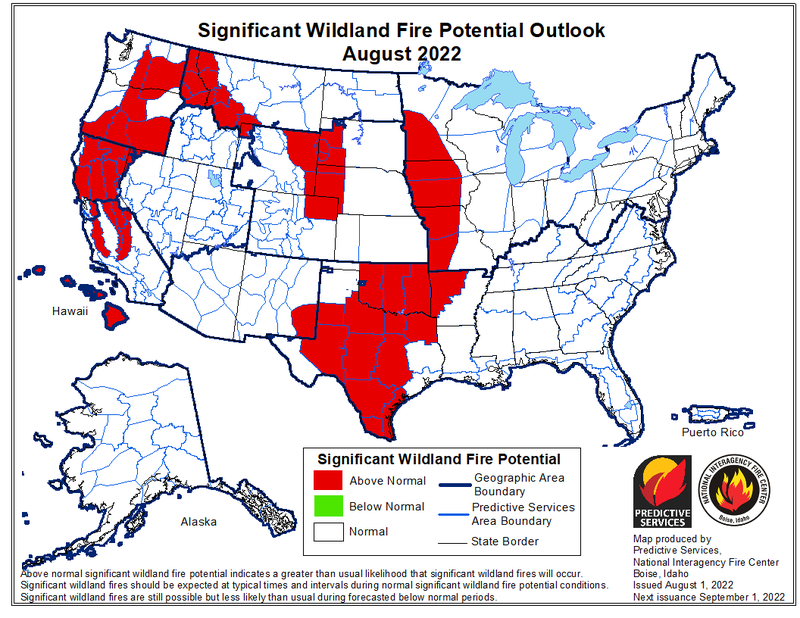 Southwest: Northern Arizona and the Four Corners region is expected to see above average wildfire potential until August, when significant wildfire potential will go back to normal. The rest of the region will see normal wildfire potential through July and August. The summer monsoon season is expected to start on time according to historical data. Rocky Mountain: After above average June temperatures and precipitation deficits, above normal fire potential will develop through August in western Colorado and parts of North and South Dakota. Normal wildfire potential is expected in the rest of the region, except the mountains of Wyoming, which have lower than normal wildfire potential. Eastern Area: Normal fire potential is expected in this region through August. Above normal precipitation occurred over the beginning of the summer and will continue through the end of the summer. Southern Area: Below normal wildfire potential is expected in the majority of the region through August due to high humidity and elevated fuel moisture levels. For more information on wildfire outlooks and regional wildfire forecasts, visit NICC Predictive Services. The National Weather Service has issued a Red Flag Warning for the Santa Barbara County Mountains and South Coast region for Thursday from 0900 hours through Saturday 1000 hours PDT. The area will see sundowner winds gusting up to 40 mph and relative humidity as low as 10%. These conditions, combined with temperatures reaching into the mid 90’s in the afternoons and 100’s in isolated locations, may contribute to explosive fire behavior. The regions most at risk are the foothills and through the passes and canyons. A sundowner wind is an offshore northerly Foehn wind that occurs near Santa Barbara, California. The winds surface when a ridge of high pressure is directly north of the area, and they blow with greatest force when the pressure gradient is perpendicular to the axis of the Santa Ynez Mountains which rise directly behind Santa Barbara. These winds often precede Santa Ana events by a day or two, as it is normal for high-pressure areas to migrate east, causing the pressure gradients to shift to the northeast. Sundowner winds are dried and heated by the warm inland valleys and deserts. As narrow canyons and valleys compress the winds, they become stronger and overpower the diurnal winds. Firefighting efforts during a sundowner wind event can become extremely dangerous as well as difficult. Three significant fires in the last three decades have resulted in part because of sundowner conditions. The Jesusita fire in May 2009 burned 8,733 acres and destroyed 80 homes while damaging 15 more. Most of the destruction occurred while sundowner winds pushed the main fire through populated areas. The Painted Cave Fire during June 1990 rapidly grew to 5,000 acres, destroying 427 buildings and killing 1 civilian. The Sherpa Fire grew to 4,000 acres overnight due to the sundowner winds, damaging the water system for El Capitán State Beach in the middle of June of last fire season.